The number of players just keeps getting bigger and bigger at the Royal Oak Michigan 2012 Summer Pickleball Tournament. This was my third year in a row to play the Royal Oak tournament and I’m more impressed each time I go. This year they dedicated this beautiful 8 court complex to one of the great ambassadors of Michigan pickleball, Pat Sullivan. Nancy Robertson, Marilyn Holladay and a host of fantastic people whom unfortunately I can’t name, put on a great party for us. The matches go on court smoothly and the lunch was outstanding. (Thanks to Sandy Simon’s wife, – forgive me if her name isn’t Linda, for the great Snickerdoodles). Other than a masseuse when we are done, you can’t ask for anything more than this great tournament offered up. I would highly recommend you include this one on your yearly pickleball tournament schedule. By the way, my son Josh and I managed a 4th place finish. People like Jim Hackenburg, Jeff Christman, Bart Ford and Al Hager just got in our way. 🙂 Thanks to everyone for a great time. See all the Royal Oak Pickleball Tournament results here. Many thanks to the Democrat and Chronicle newspaper in Rochester, New York. The world now knows that Rochester is THE place to play in the state of New York. Fellow USAPA ambassador Dave Thomas and his flock of faithful followers have put Rochester prominently on the Pickleball map. With great young players like Scott Lipitz and brothers Joe and Paul Valenti leading the way, pickleball is growing like wild. Thanks for this great Rochester article. 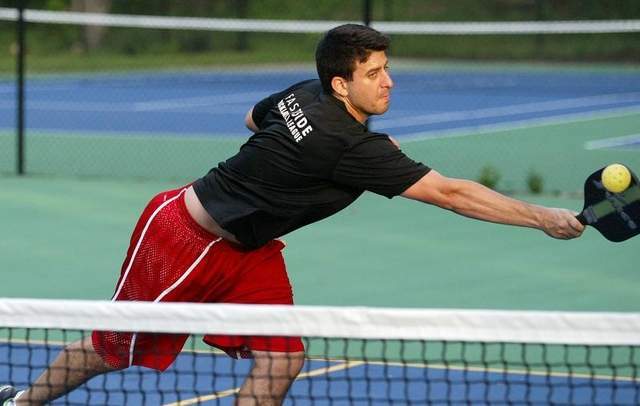 Click here to read all about pickleball in Rochester. Keep up the great work in New York. Pickleball Rocks in Rochester! There are lots of paddles out there. 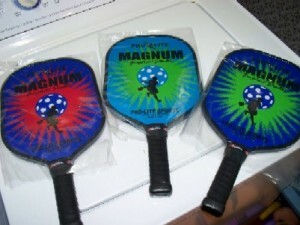 We tried several brands and settled on the paddle used by the majority of tournament players – Pro-Lite. Not only is the Pro-Lite brand used by almost 2/3rd of all pickleball players, it is used by National Champion Mark Friedenberg. That was good enough for us. We offer the best prices on high performance pickleball paddles. The PRO-LITE Classic is pickleball’s first composite paddle. This lightweight paddle is made for use at all playing levels. This paddle weighs 7.5-8.0 oz. The PRO-LITE Magnum Graphite is the cannon of all pickleball paddles. THE MOST POPULAR Pro-Lite Paddle! And new graphic designs. This is the one many of the great players use, including national champion Mark Friedenberg. When you go to tournaments, you will see this model everywhere. The ultimate shot-maker! And have you heard about the NEW Blaster? I test drove it and now carry one in my bag all the time. Under 7 ounces and all the pop of the Magnum Graphite with a tad bigger hitting surface. AMAZING! Buy a Pro-Lite Blaster HERE. And you really do need some balls to play. 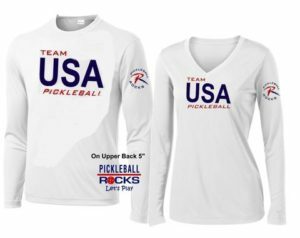 Pick up a few USAPA Approved Tournament pickleball balls. 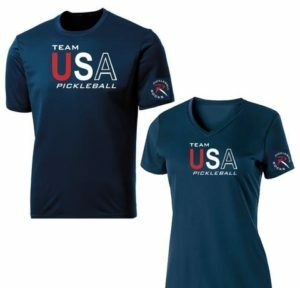 As seen at the National Tournament, including the new dri-fit “Team USA Pickleball!” shirts. As a warmup for this year’s Oxford Master Games, Southeast Indiana’s USAPA Pickleball ambassador, Rodney “Rocket” Grubbs will be conducting a free pickleball clinic for all beginners at the TRI Community Center in Oxford, Ohio on Tuesday morning August, 14th at 9:00 am. 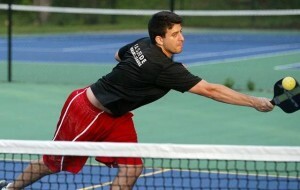 Courtesy of All About Pickleball.com “Rocket” will be on court greeting players and teaching from 9:00 am until 10:30. Paddles and balls will be provided. Come on out and try this fun new sport in our community. The TRI Community Center is located at 6025 Fairfield Road in Oxford, Ohio. Pickleball Rocks!